Is there anybody here who has any experience with this? Not I. Why do you ask? Just curious to see if anyone got anywhere with it. Part of it's legendary status is how folks barely got into it. I picked up the Gridmore book once, shuddered, and put it back down. It's been years since I looked at a copy. Seems to me it was written with composers in mind, as something to generate ideas. The fact that a lot (all?) of the patterns were written out covering a large range, from below the bass cleff to above the treble clef, meant that instruments other than piano would have to edit the patterns to fit. I recall also that there were very little descriptions or labels for the patterns. The copy in the college library had been gone through by other jazz players, and many of the patterns had chord symbols penciled in, suggesting some possible applications. Never seen this...but roughly on topic - I have the Yusef Lateef book, and think it's absolutely great. And I'm DEEPLY sceptical of this type of book! I've had the Lateef book for years, I worked on it a bit. 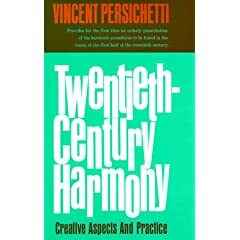 It seems like he was really influenced by Vincent Persichettis Twentieth Century Harmony: Creative Aspects and Practice. (very unlike Slonimsky himself: read his Musical Invective)! using scales and chords that may have not occurred to you to use. but rather a type of reference book of possibilities. Yeah...mysterious terms, no relating all those patterns to harmony. Maybe I'll try to get into it again this year, my reading is better these days. I'm sure Slonimsky was as opinionated as anyone. But isn't the Lexicon of Musical Invective just a colletion of other people bitching about music, and merely collected and edited by Slonimsky? This also describes the voice-leading books put out by Mick Goodrick. I have worked quite a bit with those, and in fact spent a couple of hours with one page this morning, then assigned it to one of my students. The material there is interesting in that it can be explored both melodically and harmonically. I always had fun trying to play through some of the patterns in Slonimsky's "Thesaures" but also found it baffling since, as has been mentioned here, it's a descriptive rather than prescriptive book, and you have to have a lot of harmony already under your belt to truly assimilate the information in a meaningful way. The book does have a short intro meant to suggest how the materials can be applied to tonal harmony, but, again, it's not for beginners and the terminology can be dense, especially if your prior references are all jazz-education based. In Lewis Porter's Trane's bio he notes that David Dempsy has tied the second eight bars of "Giant Steps" to one of Slonimsky's "ditone" progressions (dividing the octave into three parts by major thirds). A pattern on the top of page 40 is Trane's melody for the second half of the tune transposed to a starting note of C. Porter also points out that on page vi of the intro you can find essentially the same melody underpinned with chords similar to what Coltrane uses. (Porter's discussion of all this is on pages 149-150). Surely, other patterns and intervals in the Thesaures made their way into Trane's playing, and Slonimsky's ideas would seem to merge logically with his sheets-of-sound aesthetic and the later modal playing. For what it's worth, anyone looking for a practical book that to help expand your harmonic vocabularly of scales and arpeggios should take a look at Walt Weiskopf's "Around the Horn." Lots of information very thoughtfully organized. "Nikoli Slonimsky: Thesaurus of Scales and Melodic Patterns"
I studied it a little when I was 17 (1965). Slonimsky started as a mathematician. and embellish using symmetry. It was not meant for diatonic harmony. bitching about music, and merely collected and edited by Slonimsky?" Exactly. One critic wrote that Brahms could not write a melody. All his books are worth reading. He really was special.